Look and feel like a princess wearing this beautiful illusion-sweetheart dress. A short party dress with a sleeveless high-neck bodice that features sheer-illusion mesh at the neckline and waist to give this babydoll dress the look of a two-piece dress. Swirls of sheer lace surround an alluring keyhole detail on the open-back dress. 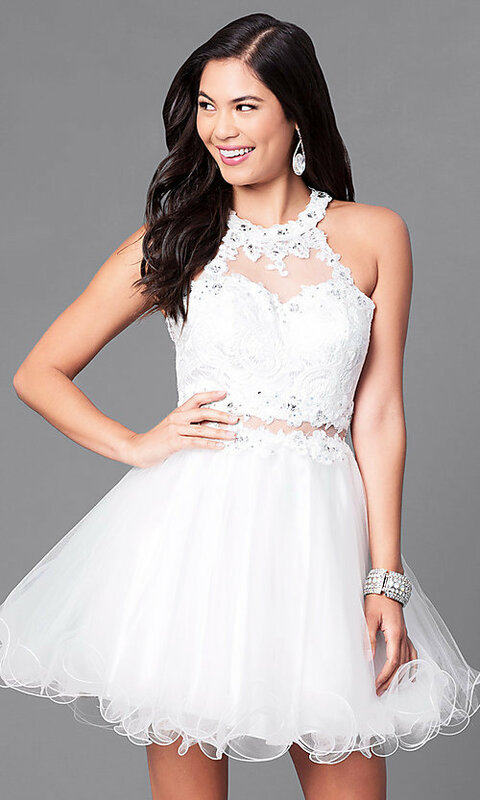 Charming lace applique with rhinestone accents trims the sheer waist to give this semi-formal dress a sparkling touch that's perfect for a holiday dress or wedding-guest dress. The gathered layered short tulle skirt on this a-line party dress has a trendy rolled hem that is perfectly styled for celebrating on the the dance floor.